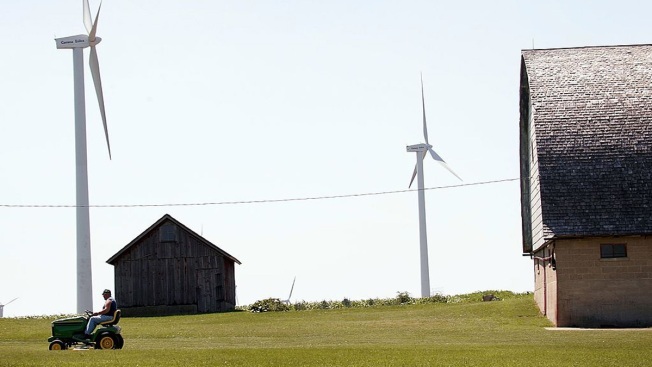 In this June 13, 2006 file photo, a farmer cuts grass near power generating windmills on his farm close to Steward, Illinois. For the first time in decades, the United States got more electricity from renewable sources than nuclear power in March and April. The U.S. Energy Information Administration said Thursday that electricity production from utility-scale renewable sources exceeded nuclear generation in both March and April, the most recent months for which data is available. That's the first time renewable sources have outpaced nuclear since 1984. The growth in renewables was fueled by scores of new wind turbines and solar farms, as well as recent increases in hydroelectric power as a result of heavy snow and rain in Western states last winter. More than 60 percent of all utility-scale electricity generating capacity that came online last year was from wind and solar. In contrast, the pace of construction of new nuclear reactors has slowed in recent decades amid soaring costs and growing public opposition. Nearly all nuclear plants now in use began operation between 1970 and 1990, with utilities starting to retire some of their older reactors. Still, experts predict output from the nation's nuclear plants will still outpace renewables for the full year, due to such seasonal variation as less water flowing through dams in the drier summer months. Also, nuclear plants tend to undergo maintenance during spring and fall months, when overall electricity demand is lower than in summer or winter. Despite the growth in renewables, the U.S. still gets nearly two-thirds of its electricity from burning fossil fuels, primarily natural gas and coal. Nuclear and renewables account for roughly equal shares of the rest, each accounting for less than 20 percent of total output.